Dale "Potsy" McBurney Aviation Scholarship - Deadline is Feb 28, 2015. NBAA Charities, in coordination with the Trust Committee for Dale "Potsy" McBurney and the National Business Aviation Association (NBAA) Flight Attendants Committee, established the Dale "Potsy" McBurney Aviation Scholarship to benefit business aviation professionals seeking professional development opportunities to advance their careers. It's the very first NBAA scholarship to accept multimedia essays. Funds up to $3,500 may be awarded to one recipient who embodies a commitment to excellence, as McBurney did. Awards will be redeemable under the conditions established by NBAA Charities and its donors. We cannot think of a better way to honor him within our industry and encourage all of you to apply for this amazing scholarship opportunity. Los Willows Event Estate is proud to announce that on February 14, 2015, we are generously hosting the wedding of American Hero, Jorge Ortiz and his “future Mrs.”, Aiyanna Coleman. On January 25, 2011, while deployed in Afghanistan, Jorge’s life was dramatically changed when he was badly injured by an IED (improvised explosive device). Marine Jorge Ortiz lost both legs above the knee, the majority of his fingers on his left hand, the use of his left thumb, and both his right thumb and middle finger were severely damaged. During one of the darkest times in his life, Jorge found his light – Aiyanna. The couple met when Aiyanna was Jorge’s massage therapist at the Naval Medical Center San Diego. Aiyanna herself has also served in the Military as an active duty female searcher and as a cook for the Army. Aiyanna continues to serve in the Navy Reserves. The couple had an instant connection with many common interests, and eventually the love birds’ romance blossomed into a beautiful love story with a “soon-to-be” happily ever after. This is where we need your help and generosity. Any and all donations are very much appreciated. Los Willows is hosting a Silent Auction in efforts to raise money for the Ortiz Wedding, so along with any form of monetary donation, an item donated to the Silent Auction is appreciated as well. Let’s see Jorge and Aiyanna’s dream wedding come to life! We thank you for your time and generosity! Greetings to all SCAA Members! I would like to thank Executive Director Debi Carpenter, SCAA President Craig Foster, and all SCAA members for welcoming NBAA and me to your Regional events during the past year. Here is a look at some of the issues, concerns and projects that NBAA is currently working on in Southern California and throughout the state. NBAA continues to partner with FAA to assure the needs of the business aviation operators are met during the Southern California Metroplex process. While FAA’s main focus is on the primary commercial service airports, Bob Lamond, NBAA’s Director Air Traffic Services and Infrastructure, has been instrumental in helping update the design of RNAV approaches into several non-primary airports in the region. In response to national legislation passed in 2014, FAA Western Region established a working group of helicopter operators and homeowner associations to explore ways in which helicopter noise may be significantly reduced in the Los Angeles area. The group met regularly over the past several months to seek agreement on voluntary procedures and routes to lessen the impacts of helicopter over-flights, and NBAA monitors the progress of the group, attending working meetings whenever possible. FAA is creating a web-based complaint system to be activated later this year. The system will help track the results of voluntary measures as they are put into place. FAA recently received a letter from congressional members who signed onto the initial legislation, stating they are “encouraged by FAA’s collaboration with community representatives and helicopter operators” and asking FAA to continue their efforts to address the issue. Regular trips to State Legislative offices in Sacramento in 2014 could yield results in the form of a State Aviation Caucus. Several legislators have expressed interest in forming and participating in the caucus where members can discuss challenges facing aviation and airports in California, and ways in which state legislators can help foster an environment for economic growth in the industry. February 3-6, 2015 NBAA will host our annual Schedulers and Dispatchers Conference at the McEnery Convention Center in San Jose. Several Professional Development courses are offered beginning Monday, February 2, with the sold out exhibit hall opening at 6:00 pm February 3 for the Opening Reception. Numerous workshops and training sessions are offered throughout the rest of the week. Thursday morning 8:00 am general session will bring a live emergency preparedness drill to the main stage, providing a realistic demonstration into the scheduler and dispatcher roles. We look forward to seeing you there! The Southern California Aviation Association (SCAA) recently presented Dan Burkhart, founder of NBAA's Regional Program, with its Wings Award for his many years of service to business aviation in the region, and his support of SCAA and its Board of Directors from the time of the group's formation in 2006. "It is an honor to be recognized by a group of your peers and friends. I believe it goes without saying, however, that the SCAA board and association members are really responsible for their success," Burkhart said. "They were already aviation professionals, and now have grown into a productive part of their Southern California community. For this, we should all be proud and I am grateful to have been a part of it." Before his retirement, Burkhart served as NBAA's director of regional programs for 14 years. In addition to building the national program, Burkhart represented the NBAA Western Region that includes Alaska, Arizona, California, Hawaii, Nevada and New Mexico. He is a retired Naval Reserve officer who served as a fighter pilot with F4 and F14 shipboard experience, and a former airline transport pilot with nearly 7,000 flight hours. Since retiring, Burkhart said he has been traveling extensively throughout the Western part of the U.S., and he relocated to a small town in Northern Nevada to be closer to family, friends, the high desert and the Sierra Nevada mountains. Upon his departure from NBAA, Burkhart's role as regional program director was assumed by Stephen Hadley, and Stacy Howard succeeded Burkhart has Western regional representative. "Dan Burkhart is an icon among business aviation operators. His strength and professionalism continue to be appreciated by those who worked with him in the industry," Howard noted. "SCAA's recognition of Dan with this award is testimony to the value of his service to SCAA members, and to NBAA Members throughout the state." We Could Lose Santa Monica Airport! This election will be that close! You have probably heard that control of Santa Monica Airport’s future could be decided in the November election. A local citizens group has put a measure on the ballot that would protect Santa Monica Airport from City efforts to strangle the airport and redevelop the property (Measure D http://www.smvotersdecide.com/read-the-initiative/). The City has responded with its own competing ballot measure that would keep its hands free to pursue airport closure. The outcome of this vote is crucial to the future of SMO! 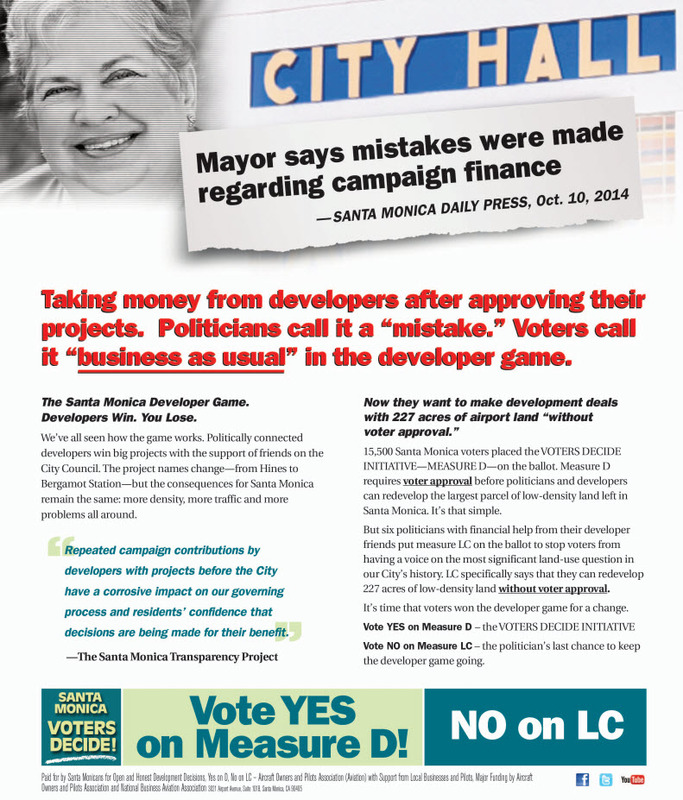 We just learned that developers are helping the anti-airport crowd, contributing to support the City’s ballot measure, and the Mayor has admitted to taking money from developers http://www.smvotersdecide.com/wp-content/uploads/2014/05/Santa-Monica-Mayor-Pam-campaign-finance-mistakes.jpg while voting to approve their projects! AOPA has been working with the campaign committee, but the fight gets tougher every day, and now the anti-airport crowd is pulling out all the stops! Pro-development forces won’t stop until the airport is closed, and SMO’s 227 acres have been transformed into high density development. If they succeed in closing SMO, every airport in California is at risk! Winning this battle will strengthen their hand, and encourage them to go after other airport properties. Let’s stop them here and now! Your support is crucial in these last few weeks. Your contribution of just $25 or $50 https://secure.qgiv.com/for/smfoahdd/ will give the campaign the resources to fight all the way to Election Day. The Campaign is also looking for Volunteers to help get out the pro-airport vote. Your help on Election Day could provide those crucial last few votes we need to win this issue. If live near Santa Monica, and can give the campaign a few hours of your time on Election Day, please contact the campaign at sfalcioni@smvotersdecide.com. Santa Monica Airport is too important to lose! Please help now – protecting SMO protects your airport too! This election will be that close! You have probably heard that control of Santa Monica Airport’s future could be decided in the November election. A local citizens group has put a measure on the ballot that would protect Santa Monica Airport from City efforts to strangle the airport and redevelop the property (Measure D<http://www.smvotersdecide.com/read-the-initiative/>). The City has responded with its own competing ballot measure that would keep its hands free to pursue airport closure. The outcome of this vote is crucial to the future of SMO! We just learned that developers are helping the anti-airport crowd, contributing to support the City’s ballot measure, and the Mayor has admitted to taking money from developers<http://www.smvotersdecide.com/wp-content/uploads/2014/05/Santa-Monica-Mayor-Pam-campaign-finance-mistakes.jpg> while voting to approve their projects! Let’s stop them here and now! Your support is crucial in these last few weeks. Your contribution of just $25 or $50<https://secure.qgiv.com/for/smfoahdd/> will give the campaign the resources to fight all the way to Election Day. The Campaign is also looking for Volunteers to help get out the pro-airport vote. Your help on Election Day could provide those crucial last few votes we need to win this issue. If live near Santa Monica, and can give the campaign a few hours of your time on Election Day, please contact the campaign at sfalcioni@smvotersdecide.com<mailto:sfalcioni@smvotersdecide.com>. CARLSBAD, CA (Oct. 15, 2014) – Southern California Aviation Association continues to advance business aviation in Southern California. And the dynamic group is bringing the region’s young people along for the journey. As part of its ongoing mission to mentor, educate and encourage young people to get involved in business aviation, SCAA is teaming with Premier Jet to host a new Aviation Exploring Post Open House on Tuesday, October 21. The event kicks off at 7 p.m. and will be held at Premier Jet’s facilities at McClellan Palomar Airport in beautiful Carlsbad, CA. The event will offer an exclusive opportunity for young people to learn about and become involved in Aviation Exploring. Aviation Exploring is a unique and invaluable hands-on program that helps pave the way for young men and women ages 14 to 20 to launch careers in the exciting aviation industry. At this exclusive event, young attendees will have the opportunity to network with pilots, flight instructors, air traffic controllers, flight attendants, aircraft mechanics and more. It will also serve as an entryway to additional Aviation Exploring events and functions for interested participants. Aviation Exploring regularly presents its young participants and members with an opportunity to participate in aviation activities like flying lessons, flight scenarios and tours of airports and other aviation facilities. Skills and practices taught at Aviation Exploring events include aerodynamics, aircraft systems, aircraft manufacturing, ground handling operations, leadership methods and more. Also headquartered in Carlsbad, Premier Jet is a comprehensive and power-packed aviation and flight-support company that continues to innovate and excel in the industry. Premier Jet offers flight support services, concierge services, hangar and office leases, charter services and more from its state-of-the art facilities, located onsite at McClellan-Palomar Airport. You can learn more online at www.premierjet.com. Desi Cechin, age 5, is fighting cancer and now she has a new ally on her side. On the morning of August 16, Orange County-based private jet charter firm STAjets will be flying Desi from the Palm Springs airport to New York City (Teterboro) so that she can undergo crucial surgery at Memorial Sloan Kettering Cancer Center. In early April, Desi doubled over with such terrible stomach pain that she was rushed to the ER. It was there the doctor told Desi's parents she had a huge, cancerous, aggressive tumor in her abdomen. Desi is fighting neuroblastoma, a rare pediatric cancer that strikes about 650 kids per year in the United States. Desi's case is the worst kind: high-risk stage 4. The bad news continued. The tumor already was 11cm x 10 cm long and wrapping around her aorta. "We are living in a nightmare," Laura Palada, Desi's mom, said. "One day she's playing at school, then the next you're living in a hospital unit. At Loma Linda University Medical Center, Desi had been going through her fourth round of chemotherapy. It is here where the family learned of a revolutionary treatment program at Sloan Kettering on Manhattan's Upper East Side. At Sloan Kettering, Dr. Michael La Quaglia performs about two tumor surgeries a week. It is, also, at Sloan Kettering where a special antibody therapy called 3F8 is used instead of the grueling bone marrow transplants which are routine treatment elsewhere. But how do you get a child with a compromised immune system to NYC from California? You need a private charter. Unfortunately, most of the charter planes that fly children to hospitals are not pressurized and are unable to fly across the country. That's where STAjets stepped in.